If you think our current, airless dance with the mercury on the thermometer is drying our throats and stopping us sleeping at night, just feel sorry for the poor people of 1911. Not only did they have to deal with one of the hottest summers on record – and its following drought – but all the posh nobs in society where still in mourning for Edward VII, which meant flouncing around Bayswater and Kensington in heavy, black corseted clothes. The temperature got to 98.06F in 1911, the highest ever recorded at the time. Ladies fainted in Selfridges, chaps were forced to take their hats off in the street. It was, more or less, anarchy. In Kings Lynn, in July 1911, the temperature got to 92F, which was bonkers, so someone told the King, in the lunatic hope that he could do something about it. He clearly couldn’t, because in mid-September 1911 the temperature was still 92F so that shows you how useless Kings are. One thing that the ruling classes did decide was that part of the solution lay in getting the poor out of bed earlier. In Lancashire towns, still dominated by the quarry industry, workers were shoved out to work at 4.30am, and would finish their day at 12 noon, before the heat became overwhelming. New-fangled motorcars being operated upon by squires from the shires suddenly found themselves grinding to a halt and getting stuck in the road. A new road covering melted into black glue in the heat and trapped motorcars. It was crap. No one thought much of this “asphalt” business. Meanwhile in August, it all got a bit political, with 5000 workers at The Victoria & Albert Docks walking out as they refused to work in the heat. Early harvests got taken in and pastures turned brown. Soon “bush” fires broke out. It was like Australia, but with nicer clothes. Wells ran dry, farming was disrupted and The Times ran a “Deaths by Heat” column daily, which meant you could rise from your stultifying, hot bed, retire to your morning room and have a quick read to check up on how many of your friends had died. The next hottest summer after that was 1990, which most of us didn’t notice, because we were preoccupied in wearing day-glo scrunchies, lycra shorts and doing aerobics. 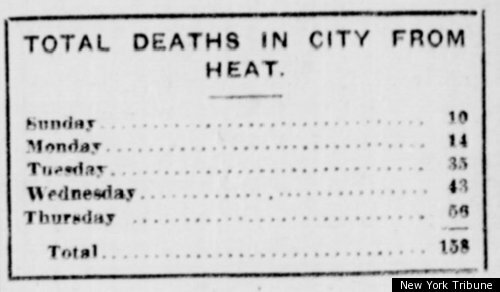 Not one person pointed out that the surefire way to add yourself to the numbers of the “Deaths in Heat” column was to do aerobics to Vanilla Ice whilst wearing lycra, the very Beezlebub of manmade fibres. They had to close off a large section of the Peak District in case all the lycra in Britain got together and caused a nylon based fire. At the very least, they were hoping that New Kids on The Block would be able to douse the flames by using their supply of hair gel. Some people died, I think, but – hey – at least the Peak District was all right. If you’re wondering what happened to 1976, it is because you were stoned. But actually, although 1976 was the driest, drought-iest summer in the 20th century, it was not actually the hottest. Temperatures reached 35.9C in Cheltenham, which was very exciting for Cheltenham, but still below the 1990 heatwave top heat recorded of 37.1C. The issue with the 1976 heatwave was its longevity. It started in June, when I was born as I had brought it with me from my mother’s womb. Between mid-June and mid-September temperatures hung dizzily between 80F and 96F. It was further exacerbated by a dry autumn in 1975 and a mild winter in 1975/76. It was awful. People didn’t know whether or not to take their flares off and jump naked into the Finchley Lido. So, when we view the summer as a whole, through the shade of our tinted 70s specs, it comes in as the hottest, 1970s-est summer ever known, but in other summers there have been specifically hotter months. But 1976 was, like, serious, man. They appointed a Minister for Drought and everything, but unfortunately they appointed Denis Howell. His job was to go around staring at empty reservoirs whilst shaking his head and coming up with absolutely no rain at all. Astonishingly, the only advice the government could give us was “share water, bath with a friend” which is the sort of thing you could say in the days before everyone worried about paedophiles. Of course, they did have child abuse then, they just called it something else, like “public school”. The 2003 heatwave was amazing. It actually encompassed all of Europe, making it the hottest summer for Europe since the sixteenth century. 70,000 Europeans hit the “Deaths in Heat” column that summer. It was a late bloomer of a heatwave here in England, not really getting going until early August, but when it did it the temperature pipped 98.8F in Kent, and even Scotland stopped complaining of the cold. An unexpected benefit of the European heatwave was Hungary, who had an exceptional year for wines, due to the maturity of grapes coming earlier in the summer. Hungarian wines from 2003 won nine gold and nine silver medals in wine awards in 2003. Anyway, I missed most of the excitement as I sat in the garden and read War and Peace that summer, so there’s six weeks of my life I won’t get back. Still, it could have been worse. In Portugal, an area of forest the size of Luxembourg was destroyed by fire. Ever since then, it seems, we have a heatwave every year, or every other year. Each one seems to outstrip the last in terms of its Flames of Hell hotness. 2006 was a bit of a humdinger, if I remember, whiling away mornings on the Northern Line which had a humidity that made everyone go a bit loopy. The oddest impact of 2006 on London was the power cuts, which meant that parts of Piccadilly Circus and Regents and Oxford Streets had absolutely no power at all, which we all thought was rather funny, but apparently it wasn’t funny and some people got a bit cross. The Environment Agency stated that the drought that ensued was the worst for 100 years, which knocked all those in the 1976 camp into touch. It was also the warmest July ever in Russia. Kaliningrad reported a high of 70F, which is like Bognor on a bad day. By July 2013, we were just fed up with everyone making such a fuss. Now, we had the information that July 2013 was the third warmest on record to deal with (and still the Victoria Line did not have sufficient airflow) and there wasn’t really a point in calling it a “heat wave” if it was simply what was going to happen every July shortly after the end of Wimbledon. Amongst the advice given on the website for a heatwave is “avoid tea”. This is England. This website shall fail. Incidentally, in case you wondered, we are not actually in a heatwave. Or maybe we are. You see, the UK has no definition of what a heatwave actually is, which is helpful. Meanwhile it’s bloody hot where I am. Knew I shouldn’t have dressed in mourning for the King. Stay cool, kids. feeling the heat here in Skyros – brilliant post Lady Genius!